This lesson will guide you through the process of editing/deleting a student grade after publishing. This is a permissions based feature and must be turned on by your District Illuminate Administrator. 2. 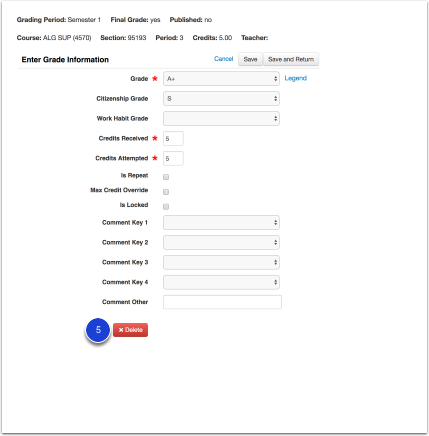 Under Editing, select Edit Grades by Student. 1. 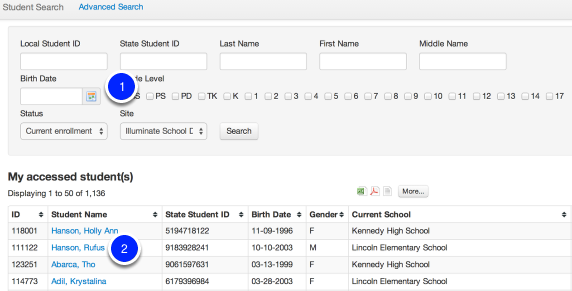 You will be taken to the Student Search page, find the student you would like to edit grades for. 2. Click on the student's name to access their grades. 1. Make your edits using the dropdown menus. 2. Is Repeat- Check if this grade should be flagged as a repeat grade on a student's transcript. 3. Max Credit Override- Check if the credits given for this grade should override any max credit settings for this course in course details. 5. When finished, click either Save or Save and Return. You will receive a success message stating, "Student grade has been successfully saved." 4. On the resulting page, click on the grade that shows in blue you want to delete. 5. Scroll to the bottom of the resulting page and click on the red Delete button. This is permission-based. 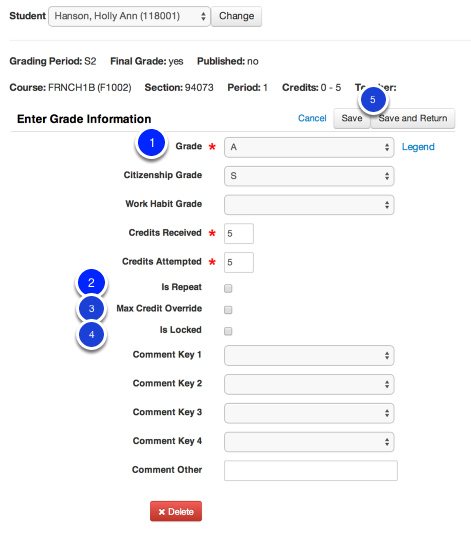 If you find you need to remove an entire section's worth of grades for a grading period from transcripts, you can use the Unpublish Grades option. 1. If needed, change your Control Panel to a date within the target grading period. Note: There is a difference between Unpublishing and Deleting Grades. Unpublishing removes from transcripts, but grades data would remain with the section and student. This means unpublished grades would still print on Secondary Report Cards. Deleting grades will remove the grade mark altogether so the grade will not print on either Transcripts or Secondary Report Cards. Deleting can only be done on a student-by-student basis by going to Grades > Edit Grades by Student.